Several Israeli army jeeps invaded, on Sunday at dawn, Nour Shams refugee camp, east of the northern West Bank city of Tulkarem, and abducted three Palestinians. The soldiers also summoned for interrogation three Palestinians from Hebron. Media sources in Tulkarem said the soldiers invaded and ransacked many homes in Nour Shams refugee camp, and interrogated several Palestinians, while inspecting their ID cards. They added that the soldiers abducted Haitham Mer’ey, Mohammad Fahmawi and Mohammad Ahmad Fouda, and took them to an unknown destination. 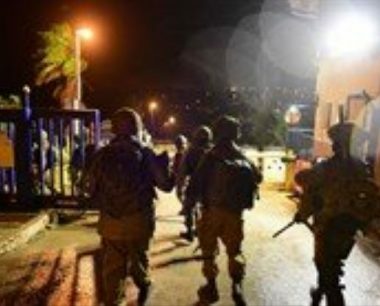 In addition, several army jeeps invaded Halhoul town, north of the southern West Bank city of Hebron, and searched the homes of two former political prisoners, identified as Mamdouh Abu Asba and Ayman Jabarat, before summing them for interrogation in Etzion military base. The soldiers also invaded the homes of two other former political prisoners in the town, and searched them. Also at dawn, the soldiers abducted four young Palestinian men, and summoned one for interrogation, after invading and searching their homes, in Bethlehem, in the occupied West Bank. In related news, the Palestinian Health Ministry in the Gaza Strip has reported that a young Palestinian man, identified as Osama Khalil Abu Khater, 29, died from serious wounds he suffered last Friday, after Israeli soldiers shot him with live fire. On Saturday evening, the soldiers invaded Beit Ummar town, north of Hebron, and injured several Palestinians, who suffered the effects of teargas inhalation.